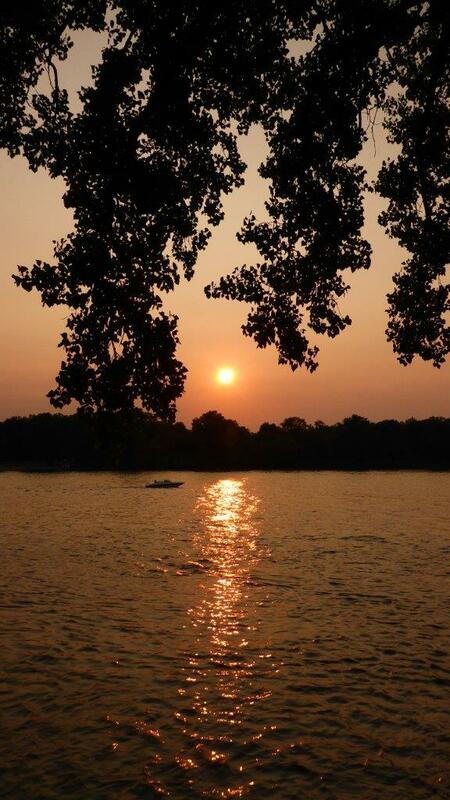 We try to be just and virtuous people, but God knows the mind of the divine is mysterious and unknowable. And thus one evening in Lansing, Iowa He brought down His wrath upon us, perhaps because we had drunk two too many White Russians and did not even offer Him a cocktail. We had retreated to the shelter of the shantyboat from the swarms of mosquitoes, but it was sweltering in the excruciatingly hot and perfectly still night. We took turns ineffectually shirtlessly fanning each other with a piece of cardboard we had in the boat. This was the first of the many signs and wonders we were to experience that night. We were hot and sweaty and so decided to visit a local bar which we hopped would have air conditioning. We walked uptown to the Other Place, the one bar of the four or five in town that looked like it had a little life in it. It was blissfully cool. Even excessively so. I suggested that perhaps it doubled as a meat locker. The bartender was brusque bordering on hostile and grudgingly served us our beers. Clearly, He had hardened his heart against us. The other denizens of the bar seems to feel similar, though Hazel, as always, won friends who fed her cut up Slim-Jims. Slowly our saturated clothing froze to our bodies in the sub-arctic temperatures of the bar. After a while we screwed up our courage and prepared to push out into the sweltering night. In the brief time we were in the bar, He had loosed his swarms upon the town. 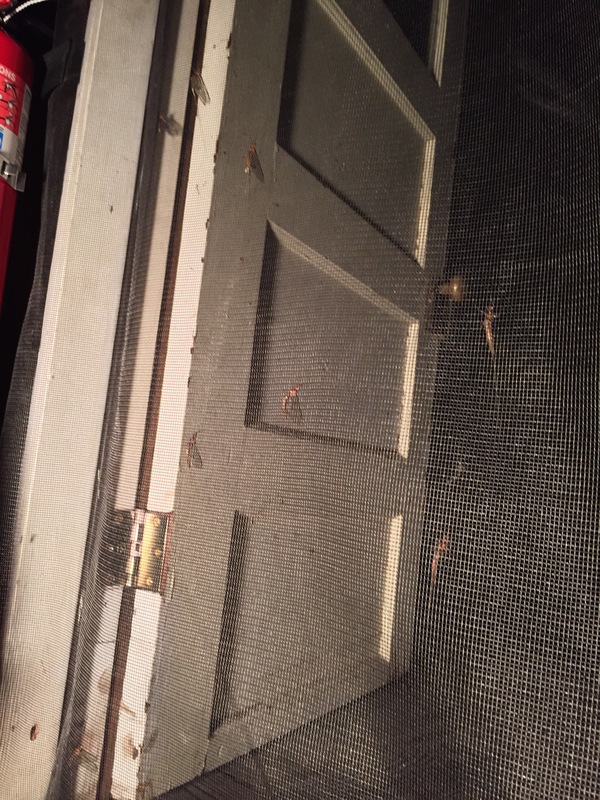 There were thick tornados of bugs swirling around every light. The corpses of dead bugs were an inch thick on the ground. 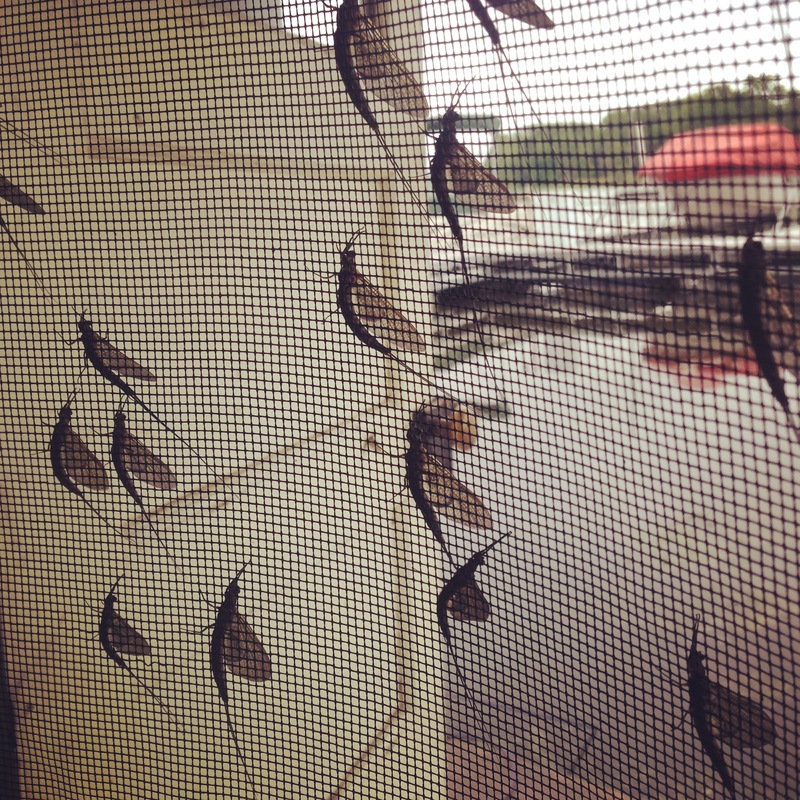 These were mayflies, called “fishflies” locally. They hatch once a year, around this time. There are several species with their own timing variations, so periodically over a several week period, riverfront towns are deluged with mayflies. Later people told us, “Oh, that ain’t nothin’. Last week they were piled 6 inches high all over town.” And while we were experiencing the plague, it wasn’t much of a consolation to know that the return of the mayflies to river communities, gone for so many decades, is a measure of the health of the river. We threaded our way through town, sticking to dark streets and trying to avoid the creepy bug vortices. By the time we made it back to the boat, the town officials had scrambled an emergency blackout. One by one, the lights of the harbor, the streetlights, and the lights on Lansing’s historic bridge winked out. We went to bed (after another round of fanning) sleeping fitfully and sweating profusely. But He was not done with us. Oh no. We woke up at 3am to a cataclysmic wind. Gusts were threatening to rip the roof off of the boat. Sheet metal was rattling violently. The shantyboat was bucking to and fro. And soon the wind whipped up waves across the long reach. Big waves. Scary waves. We began to dart around, battening the things that were sliding around the cabin. We had to remove the lanterns violently swinging against the walls outside. It took an effort just to get outside with the door trying to wrench from my grip. I had to walk hand over hand on the pitching and heaving deck. We remembered the Donboat which was being swamped by the giant waves. The rain was beginning to fall and we were getting soaked. We pulled and heaved at the Donboat until we finally got it up on the dock, hoping that would be enough to keep it safe. By this time the rain was coming down in sheets with a sky full of lightening. we retreated to the relative safety of the cabin. Outside, the storm raged. The waves battered the boat from below and the rain from above. Lightening shattered the sky. Inside, we held on to stationary supports and were careful not to touch the sheet metal roof through the long night. Perhaps He was testing us, or perhaps He sent His plagues to return us to the Righteous Path. Or perhaps we will never understand the mind of the infinite and our night of tribulations will remain a mystery. In any case, we were no longer heedless of His wrath. 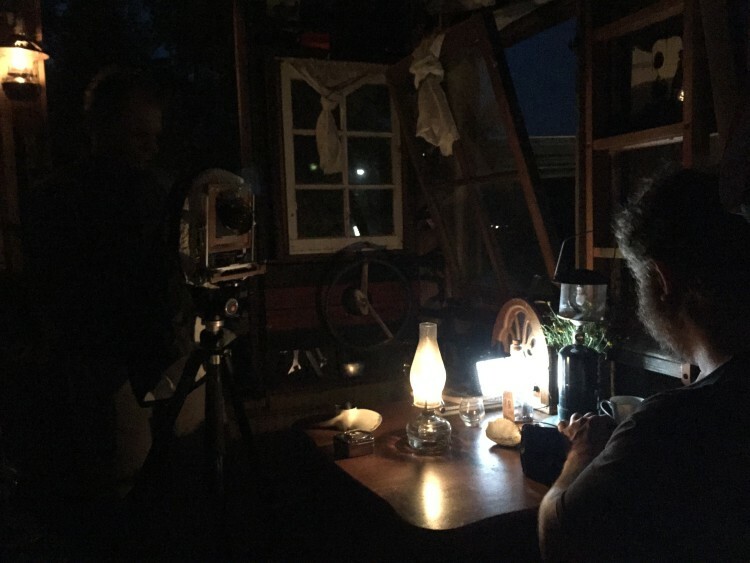 A Watery Death on Lake Pepin Narrowly Averted Down to St. Paul and Out in a Storm Into the Storm on the Open River Shantyboat Guys New Episodes! Stuck on a Sandbar, Civil Defense, and Flying Predators Introducing The Shantyboat Guys!